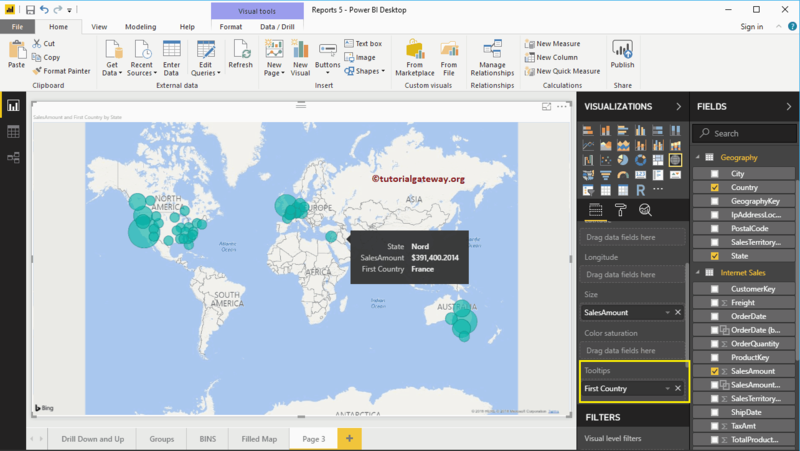 Power BI Maps will help you to visualize the geological data. In this article we will show you, How to Create a Map in Power BI with example. 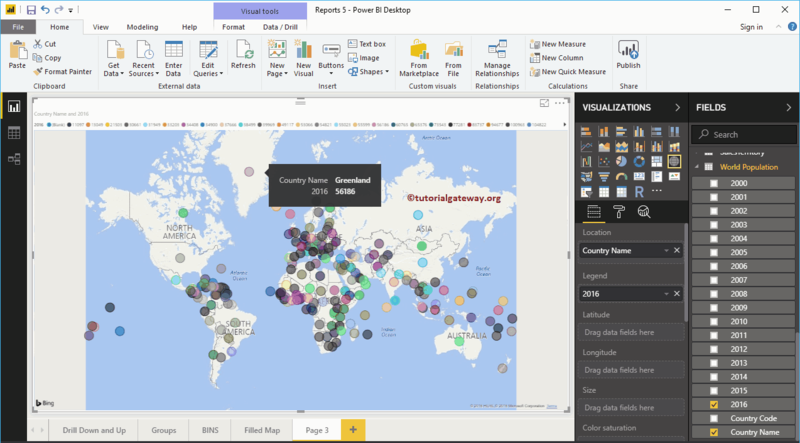 For this Power BI Map demonstration we are going to use the World Population data that we downloaded from the Data bank (in Excel format). 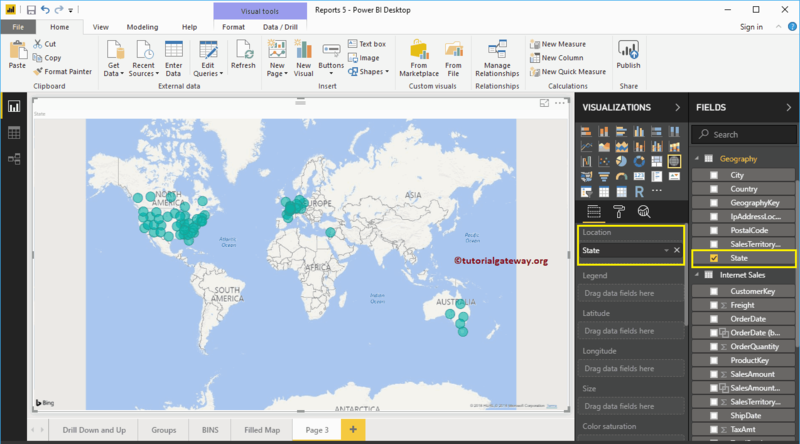 Please refer Connect to Excel article to understand the steps involved in working with Excel. 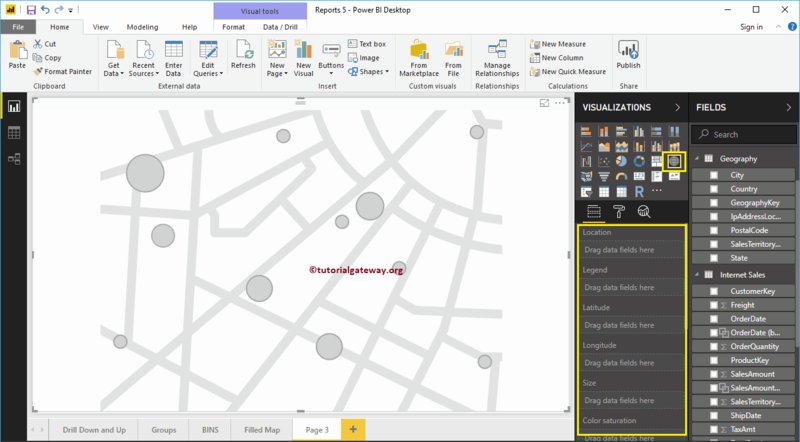 Drag and Drop any geographical data to Canvas region will automatically create a Map for you. Let me drag the Country Names from the world Population table to the Canvas. 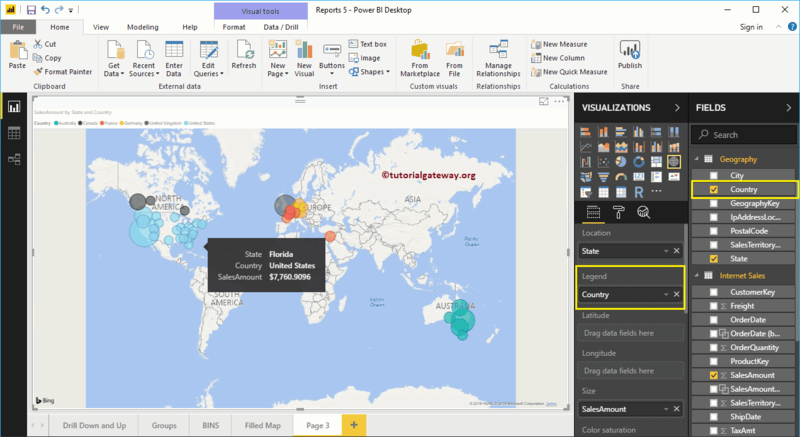 From the below screenshot, you can see that the power bi has created a map for you. Next, Drag and Drop the 2016 Population from Fields section to Legend region. Hover-over any bubble to see the country it represent, and the country population. 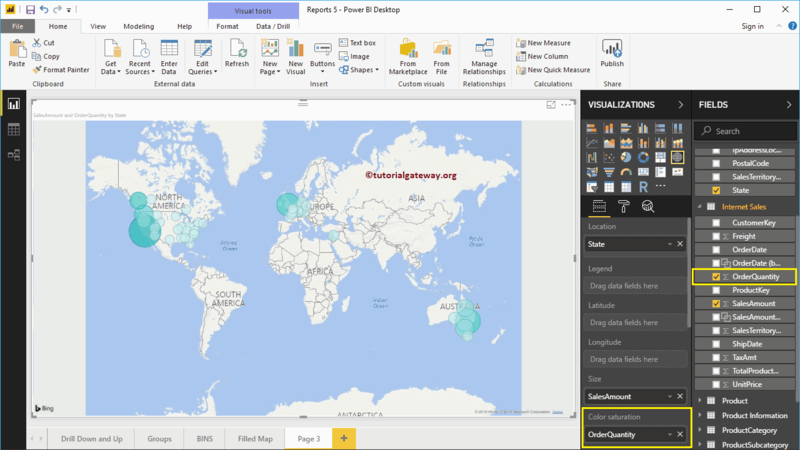 First, click on the Map under the Visualization section. 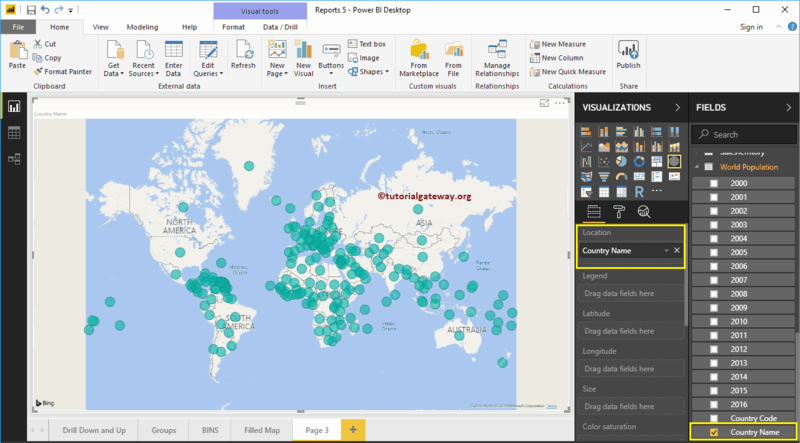 This will automatically create a Map with dummy data as shown in below screenshot. Location: Please specify the Geological Column that represent the Bubbles. Latitude and Longitude: If your data has latitude and longitude information then you can them to get the exact location. Color Saturation: Any Numeric value that will decide the Power BI map bubbles color. Let me drag the State from Fields section to Location Section. You can do this by dragging State to Location section, or simply check mark the State column. Let me add Country Name to the Legend section. As you can see, color of bubbles are changed based on the country they represent. 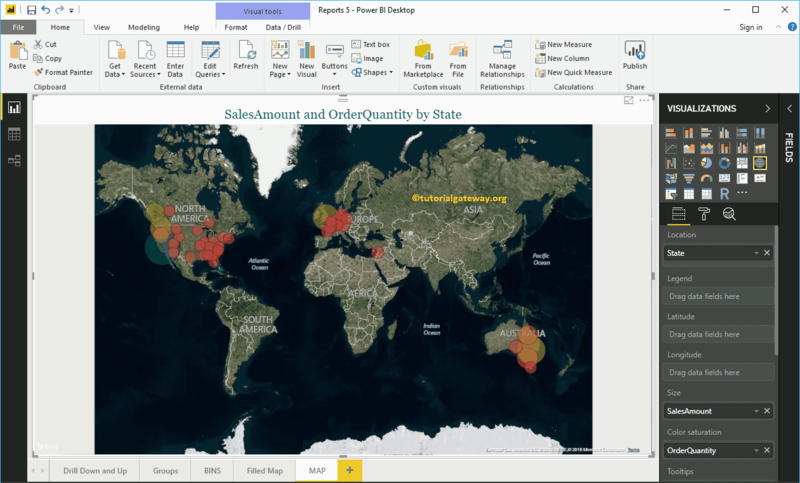 To demonstrate the Color Saturation section of a Power BI map, we added the Order Quantity to the Color Saturation section. As you can see from the below screenshot, color of each circle has changed as per the Order Quantity. Remember, you can’t use the Legend and Color Saturation at the same time. NOTE: I suggest you to refer Format Maps article to understand the formatting options.